“I’m sorry,” my paladin says again, offering another sand pear. I can’t resist the treat, so I take it from her hand, crunching on the sweet fruit, enjoying the juices and grainy texture. It’s a nice distraction from the pain. My shoulder is on fire. My armor is gone, feeling too heavy for even my Light-granted strength. My paladin carefully runs the curry brush over my form, making my dark coat gleam. She’s careful around the healing wound. She sniffles, and I wicker an encouragement, turning my head around to rub against her. She hugs my head tightly, her burn-scarred hands rough and familiar. I wasn’t enough backup; she could have, and should have, called for help. The Foul Woman had something on the dagger she threw at me, something that could affect those of us spirit beasts who walk the physical world with our charges. It slipped between my plated armor and I hurt. When my paladin called my name, needing my help, I could barely respond. She had to let the Foul Woman go to save me. I think things would be worse if my paladin had pressed the attack. This is bad enough; I can’t fight, I can’t even carry her across the city, let alone into battle! I can dissipate back to the Light for a few hours, which is a relief. My physical form, however, is still injured, and needs to heal at a normal pace. So I remain physical, pretending like I am a regular horse again, talking to the husband’s companions when our people aren’t in need of us. I guess sharing my paladin with the wolf-dragon-man isn’t such a bad thing, in the end, when his companions are so agreeable. Avalanche and I exchange war stories, while Moriarty is young and energetic still. 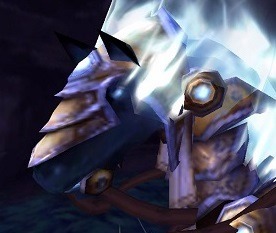 And I know the husband will take care of my paladin while I cannot be there to carry her. I simply must heal as quickly as I can. I don’t want them to get too used to that, after all. So I shall eat hay and grain (I hadn’t realized how much I missed both of those things) and all the sand pears my paladin can find for me. I shall sleep surrounded by the smells of other horses, of worgs and other, more exotic animals, and be content. For now. When my shoulder stops being on fire, and I can wear my imbued armor once again, and take my paladin upon my back to run or fly across the battlefields, then I shall be truly happy. And the Foul Woman beware, should she meet me again. I won’t wait for my paladin’s command next time.